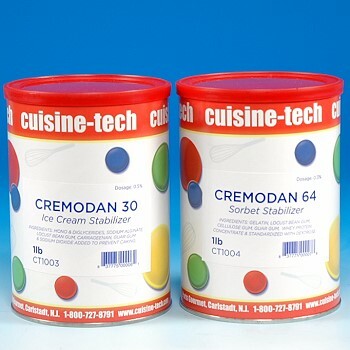 Ice cream and Sorbet powdered Stabilizers improve texture and preserves creaminess by minimizing the size of ice crystals. Use 5 grams (1 teaspoon) per 1000 grams of base (35 ounces). Blend together with dry ingredients or create a small slurry using some of the base liquid. Once dissolved, blend into the remaining base and thoroughly agitate. Base should be heated to 180F to pasteurize. Let sit refrigerated for 4 hours or up to 12 hours. Use 3 grams (3/4 teaspoon) per 1000 grams of base (35 ounces). Blend together with dry ingredients or create a small slurry using some of the base simple syrup. Once dissolved, blend into the remaining simple syrup and thoroughly agitate. Simple syrup base should be heated to 180F to pasteurize. Add fruit and fruit puree.